This system was originally manufactured in the1870s and is undoubtedly the first electric watch clock to be widely accepted. The system employs a battery and one pair of wires running to all the tour stations, over which any of the stations may send a signal to this central unit. On visiting a station, the watchman wound the station mechanism's mainspring. 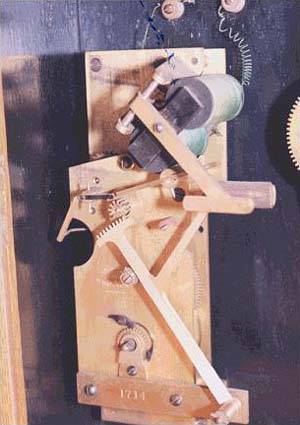 When he released it, an escapement allowed the mechanism to run down over eight seconds or so. In running down, a code wheel would "make and break" the electric circuit, sending a coded signal that identified the originating station. At the central recorder, the first signal pulse releases the recorder's clock mechanism and allows the pinion gear (seen at the center in Fig. 2) to start "lifting" the long arm with which it meshes. The portion of that arm that extends upwards to the right carries a pinprick or a marking lead at its upper end (out of sight here, behind a broad hammerhead). As the marking element is carried across the recording dial surface, from near the outer edge toward the center, further incoming signal pulses cause the solenoid coils to pull on the hammer and thus force the marking element against the recording chart for an instant. This leaves a trail of dots and spaces which identifies the station. Recorder No. 1714, which we illustrate here, employs a Seth Thomas No. 10 movement for rotating the recording dial. In the early years the recording unit was mounted with a fine E. Howard regulator that powered the dial mechanism. To provide for a second circuit of watchman stations, a second recording unit could be mounted on the right of the dial. This unit was more or less a mirror image of the first one, but with a longer marking arm that resulted in its marks falling in second annular ring inside the peripheral ring used by the first recorder. The system could be built with multiple dials and recorders. An advertising cut exists showing nine dials and recorders for 18 circuits. 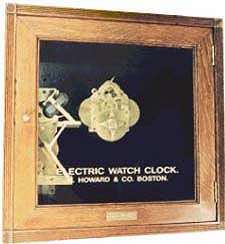 The demise of the Howard Electric Watch Clock dates from 1904 when Eco Magneto Clock Company's patent on magneto watchclock systems expired. That opened the magneto signaling field to several other manufacturers. See I.D. 301 et al. With adequate competition assured, rating organizations no longer felt compelled to approve battery-powered systems. It is quite certain that Underwriters' Laboratories, Inc., which commenced listing watchclocks at just about that time, never listed a battery-operated tour system.